The most frequently used excuse for not owning up to taking responsibility for your life. It is an easy cop-out to say that you are a product of your environment. It’s easy to blame someone else for your current state of affairs. It’s even easier to blame someone else for your anger and anguish. 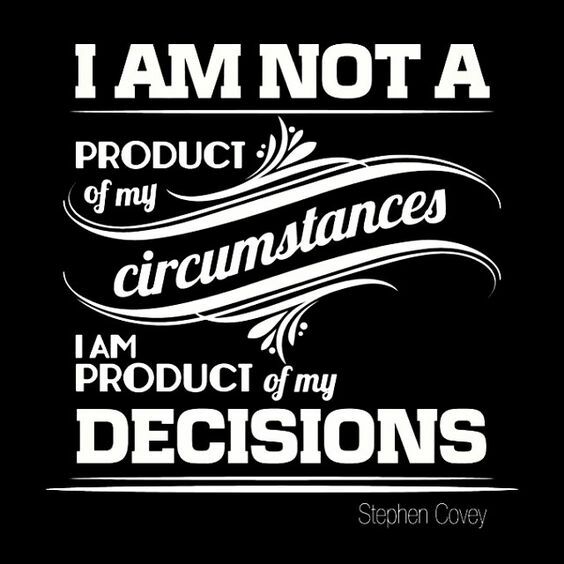 You are not a product of your circumstances but of your decisions. You have a choice to be happy. You have a choice to see positivity instead of negativity. You have a choice to rewrite the narrative as the victim. Making decisions is hard because then you are the one who is ultimately responsible for its outcome. But imagine for a moment, where one decision can change your trajectory for the rest of the day or the next month and maybe into the next few years? Make a decision that supports your dreams. Make a decision that supports building your character. Your circumstances will always change, but your character should not.